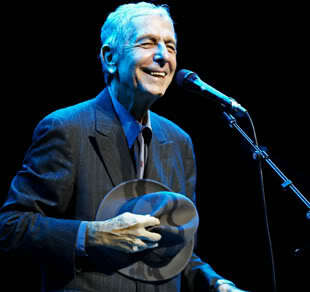 This is not a Leonard Cohen site** though he does show up quite a lot. Leonard, or Mr. C as I often call him, is in my cells, bones and heart. His body of work and the very particular way he uses himself to deliver it, has and does, sustain me. His voice and lyrics dance around inside me and offer commentary, comfort and humour, quite unbidden. I really can’t imagine myself without him. He does feel like a friend. Okay, so not the going out for dinner and hanging out sort of friend, but a friend nevertheless. A friend in the mystery and in the prosaic too. My phone alarm has Leonard singing I’m Your Man, so he always tells me when to take a cake out of the oven. Thanks Leonard, I always say, I’ve got it. And as for all that rampant mythology about how depressing he is, and him being suicide music etc… zillions of us that are prone to depression would testify he’s the opposite. Songs that bring solace, tenderness, possibility and wide open spaces, to the ravaged and weary. Prayers to all that is human. Luminous poems from dark corners and so many cracks where the light streams in and forgives us all the mess. I’ve found a few fragments of soul and the odd body part, in the mirrors of Leonard’s work. I don’t know that I’d have made it from a defeated, destructive teenager to a late middle aged, tenderness queen, without his company and help. I can only keep breathing him in and saying thank you, for that. You can’t really see me, without seeing Leonard alive in me, hence this not so serious disclaimer. He’s in the bricks of my church, though never a religion, as worship turns me off. Grace, prayers and the running waters of gratitude, yes, but elevation and worship taste all wrong to me. In the unlikely event of my going out to dinner with Mr. C, I believe he’d be as delighted with me as I would be with him.